The Chargers’ Isis Moore (15) tries to get a shot off against the Cavaliers’ Hope Toliver during Friday night’s game. The Chargers’ Bianca Atkinson drives ahead of Cavaliers defender Mykaila Smith during a Conference 19 clash at Chancellor High School on Friday night. Chancellor’s Gabby Coley (left), who scored 11 points Friday night, drives in for a layup try early in the game. The Chancellor girls basketball team has shown a tendency this season of playing with more composure toward the end of games. The Chargers would prefer to play that way for a full four quarters, but at least they pick the right time to turn things up. They did it again Friday night in a 50–32 home Conference 19 victory over Caroline, turning a close game in the third quarter into a convincing win. “They calmed down in the fourth quarter and went on to play their game,” Chancellor head coach William Griffin said. The Chargers (10–4, 4–1) never trailed, but the Cavaliers (8–6, 1–2) pulled to within two points midway through the third. That’s when Chancellor flipped the switch, out-scoring Caroline 18–0 over a six-minute span to take control. Chargers senior guard Gabby Coley scored five of her 11 points during the game-turning run, including a 3-pointer from the left corner late in the third. Chancellor’s post duo of Lalicia Young and Sydney Collins locked down the paint on defense and scored 14 and six points, respectively. Junior point guard Lachaunda Patterson had 12 points. Despite being double-teamed throughout the game, Caroline forward Hope Toliver led all scorers with 16 points, and she was a major presence on the boards. 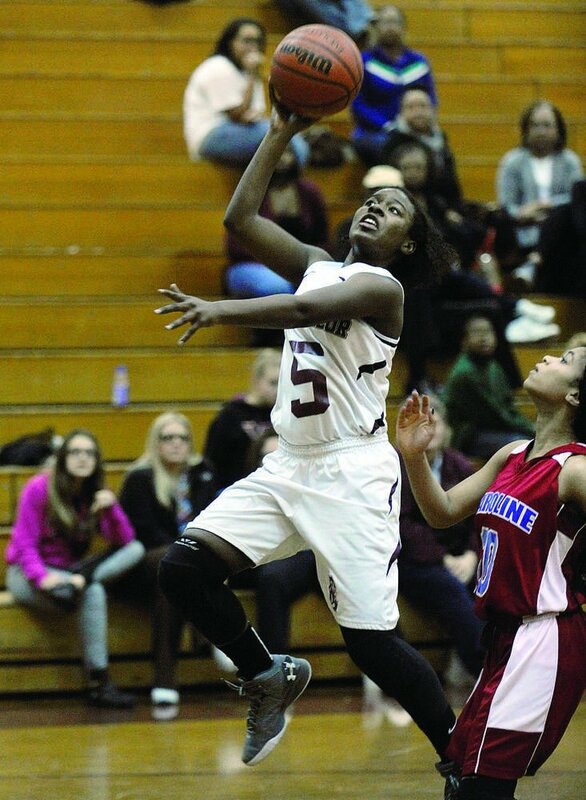 Chancellor led 17–9 early in the second quarter, but Mykaila Smith and Toliver, the area’s top scorer, closed the gap for the Cavaliers. Smith, who finished with 12 points, hit a running jumper and made two free throws to cut the deficit to four and then Toliver scored five straight points on a three-point play and a layup to make it 22–20. “I had one girl playing behind and one in front [of Toliver], and she still got her stuff. She’s a good player,” Griffin said. The Chargers struggled offensively for much of the third quarter, missing an assortment of shots right under the basket. Coley broke a four-minute scoreless spell with a fast break layup with 2:42 remaining in the third. It was the first of three straight field goals to end the period. Chancellor’s hot shooting continued in the fourth. Collins sank a jumper and Coley swished a 3. Patterson made consecutive layups to increase the lead to 46–26. Late-game struggles are nothing new for Caroline, which scored only 12 points in the final two quarters. The Cavaliers have had problems closing out games before. Chancellor has also had trouble maintaining the same level of play for four quarters, but it continues to find ways to win in the end. Three-point goals: Caroline 0. Chancellor 2 (B. Atkinson, G. Coley).